Just a few weeks into this quest to understand who wrote the plays of Shakespeare, and I have to say, if you’re trying to keep your brain active, forget Sudoku’s or cryptic crosswords, there’s more than enough here to keep the synapses busy. Anyway, as I mentioned, I started off with a book by Diana Price – Shakespeare’s Unorthodox Biography, because it was obvious very quickly, that I didn’t know very much at all for sure about the writer, and I wanted a source that would look at the actual evidence, and discuss its context and interpretation in a less emotional way than those authors who are closely bound up with theories for particular candidates for the Shakespeare authorship. It’s not a particularly difficult read, but you’re not far into it before you start to understand just how complicated this quest is – what we have, it seems to me, is a giant Elizabethan jigsaw puzzle, with most of the pieces missing, and to make matters worse, we don’t know if the pieces we do have, fit together in one puzzle, or whether some pieces are part of an entirely different puzzle. 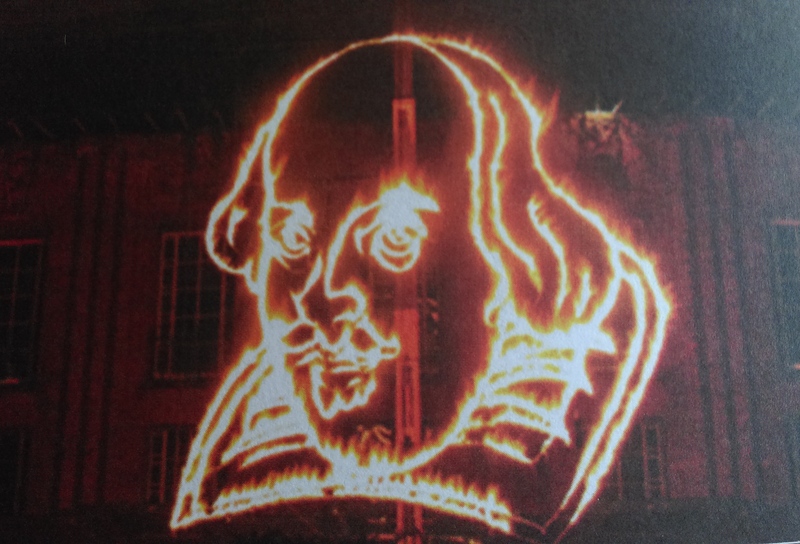 But before I get carried away, the first question I wanted to answer was this – why is there any debate at all about who wrote the plays of Shakespeare, after all, we’re familiar with his name, his plays and his connection to Stratford-upon-Avon – where is the area of doubt? The answer – it seems – is that whilst we can be pretty certain a man called something like William Shakespeare (even the question of alternative spellings could keep you busy for months…), went to London and was involved in theatrical companies there, no contemporary evidence survives which confirms him as a writer. So, going back to the jigsaw analogy, we have about 70 pieces that could fit into a picture of a Stratford actor, financier, play-broker, wheeler-dealer, but none that fit into the picture of a playwright. That means, either he did write the plays/poetry, we just don’t have any evidence, or, someone else wrote them. And that’s the debate. Into that gulf of un-knowing, flows a massive river of conjecture, theory and conspiracy – brilliant isn’t it! So, the result appears to be, that people who think the man from Stratford did write the plays, look at the pieces of the jigsaw and try to fit them all into a picture of a playwright, trimming off the edges, bashing pieces that don’t fit too well, hiding the really difficult bits under the carpet, until they accommodate the pieces into something resembling a playwright. Whilst people who think someone else wrote the plays, look at the pieces and say, no, these pieces don’t belong to the picture of a playwright at all – William Shakespeare must have been the pen-name of an aristocratic person, unwilling to publish under their own name, we must look for clues about his/her identity somewhere else. Now, the bit that really confuses me, is this – if you’re an aristocratic would-be playwright, turning out sublime poetry and prose, but unable for reasons of political sensibility or social mores to use your own name, why choose instead, that of a Warwickshire actor with a debatable reputation? Coincidence?– really? So, without – as far as I know yet – a shred of evidence to confirm it – the assumption is, that the man from Stratford put his name to plays which he took/bought/acquired from a shady aristocratic writer, presumably in a relationship that benefited both parties – otherwise how would it have continued? My plan, now that I’m beginning to see the big picture and understand the groundwork, is to re-read Price’s book, listing out my questions to follow-up on next. I’ve become aware of a lot of the anti-Stratfordian positions so far, but in the interests of balance, I’m going to try out an orthodox biography soon to see which questions that raises. Do join the debate if you’re interested – you won’t be bored! 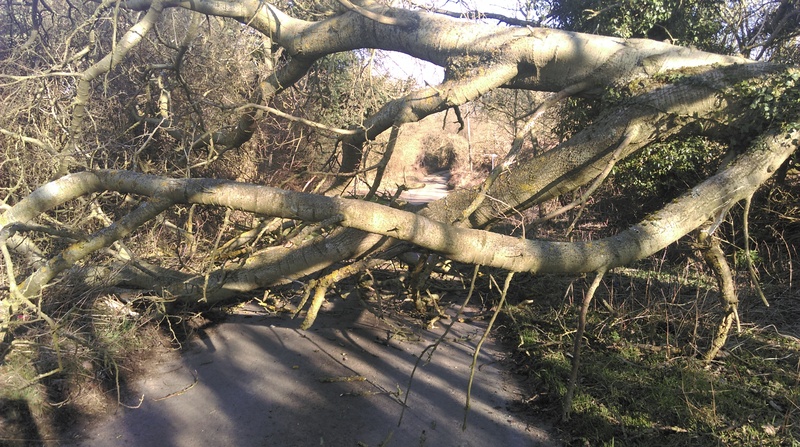 There was a big surprise in the lane this morning – a huge tree had come down across the road. Fortunately not my old oak, and hopefully nobody hurt. I will follow your detective work with fascination and interest. I think you have neatly outlined what the debate is all about. Set yourself some challenge though. Good luck and good reading! Thanks Alister. Yes, it’s supposed to drive you mad, but it’s fun – what can I say, I like a challenge. I’m happy to accept whatever the latest theory states – but that’s because I’m lazy and also because I like a definitive answer and that’s not going to happen. Big tree. I love your puzzle analogy – it really works! I’m pretty comfortable with-holding an opinion and I look forward to hearing more! Thank you! I’m determined to try and hold on to an open-mind – at least until I feel I’m much better informed – I’m sceptical and suspicious by nature, so asking uncomfortable questions comes quite easily – I think we can have a lot of fun rootling around with this whole topic. Oh, I do hate it when illusions are shattered. I do hope the bard was called William Shakespeare and did come from Stratford. I saw Shakespeare in Love on stage in London recently at the Noel Coward Theatre. Very clever and enjoyable stage adaptation. If he was the Earl of Oxford or A.N.Other aristocrat it would be a real spoiler. I might just get the book you mentioned though. Yes, Shakespeare in Love is excellent, I agree – works on different levels too, but if you read Diana Price’s book, you won’t find much in common with the character from Shakespeare in Love. Price concludes that there is sufficient room for doubt about the authorship, but before I go off exploring alternative candidates, I want to compare how a pro-Stratford biographer reads the same evidence. I hope any shattered illusions would be replaced by intriguing possibilities. I wonder what delinquent dog made of the fallen tree – indignation or a total ignoring? Oh yes, I very much doubt we’ll ever have a definitive answer, but that’s alright, I agree completely, having the works is all that really matters, and in a way, the mystery just adds to the overall pleasure. Wouldn’t it be cool if a woman wrote all those wonderful plays and sonnets? I am enjoying your hunt very much, Anny, and I’m not at all invested in the outcome, since it’s all speculation anyway. What I AM invested in is having his/her body of works in the world and in my life and available to anyone who wants to feel the delicious joy of reading/hearing/seeing those works. And I do love a puzzle. Happy hunting! Exactly! That’s precisely how I feel about it – a great mystery which, whilst highly unlikely to ever reveal the ‘truth’, is nevertheless a fascinating journey around Elizabethan and Jacobean literature, society and politics. Mind you, whilst we’re staying ‘on the fence’, there are undoubtedly people in both camps who are deeply invested in their choice of candidate, and it’s partly understanding why that is, that I find interesting – why is it so important to them to ‘prove’ a particular candidate? Verna, this one could easily keep you going for a very long time! Have you seen the most recent St. Trinians film – The Legend of Fritton’s Gold – I think there’s a plot twist in there you’d find enjoyable! I’m so glad you’re the one doing all the work, Anny – and on the other hand, I would love being on such an adventure. It’s so much fun getting your posts in my inbox. I signed up to read your blogs about stitching, having no idea I’d get Shakespeare, too. I haven’t heard about the St. Trinians films. Thanks for mentioning the latest one. I’ll check it out. I bet you feel like you’ve started wandering through a maze, Anny, constantly reaching dead-ends and having to retrace your steps before taking a different path. I look forward to the next episode. Well, there are certainly lots of different paths to explore, that’s for sure. I’m heading off to the Oxfam bookshop in Berkhamsted tomorrow to see if they have anything on the subject – it’s a brilliant little shop they have there – I suspect that finding all the texts at prices I can afford might become part of the challenge. Is there a theory that Marlowe wrote some of the plays attributed to shakepeare? Or did i dream that? The latter is a definite posibility. Glad it wasn’t your oak.